Just in time! This story is just that close to nearing "Koval-who-gives-a-flying-chuk" status! TSN, ESPN and Tom Gulitti of the Bergen Record are all reporting that the Devils have submitted a new signed contract for league review and all parties expect it to be ratified by the NHL. Just yesterday it was reported that Kovalchuk's Russian agent, Yuri Nikolaev had set a 48-hour deadline for the NHL to resolve his client's contract issues or Kovalchuk will likely play in the KHL for next season. Really? As if (as previously discussed here) Eastern European players don't have enough of a negative stigma, here is Kovy's agent demanding that the NHL fix contract issues that are between the Devils and his client! Lunacy. It certainly seems like this deal will be approved, speculated to be worth $100m over 15 years, minus the dramatic salary drop off that the first contract involved. 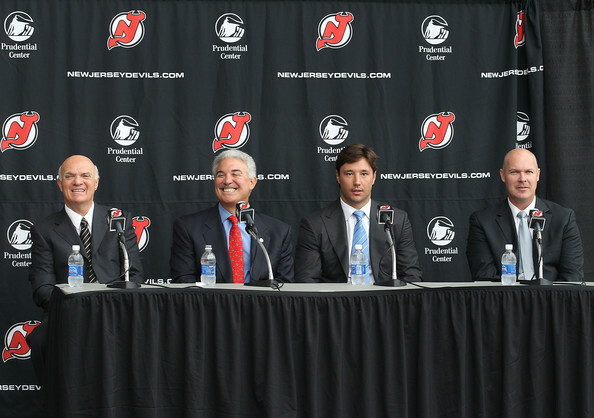 The new deal would count a devilish $6.66m against the cap each season. Please be done. Please be done. We are certainly done with this lame soap opera. btw NJD: It will be an albatross contract in 5 years... just need to pay him 10 more years after that! Woo hoo!